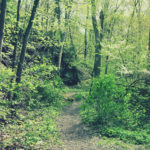 Dead Man’s Hollow Conservation Area is home to dense woodlands, an abundant wildflower population, and winding trails that lead hikers and bikers to vistas that tell of a rich and mysterious history. The largest privately protected conservation area in Allegheny County and once the site of a thriving industrial area, time and nature have reclaimed the Hollow, and visitors are now met with 450 acres of green space and a trail system that is 6 miles long and growing. A trail plan to expand the system to 10 miles is currently being implemented by volunteers and a hired trail crew. Visit our Volunteer page to get involved! The Hollow is located in Lincoln and Liberty Boroughs and Elizabeth Township in southeast Allegheny County. The Great Allegheny Passage, locally known as the Youghiogheny River Trail, extends along the property’s eastern border and serves as the main entrance to the Hollow. The GAP’s Boston parking lot is ¾ of a mile from the Dead Man’s Hollow Conservation Area trail access. There are two other trailheads to access Dead Man’s Hollow; one is at Catfish Pond, and the other along Calhoun Road. Open Hunting is permitted on this property. We ask that hunters read our Hunting Policy, apply for a free permit before hunting on any conservation area. 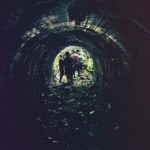 Explore the ruins of a factory that thrived in the Hollow 100 years ago. Climb the Enchanted Staircase on the Witch Hazel Trail. 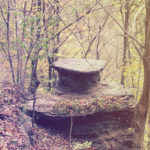 Hike to view Table Rock, an unusual siltstone formation. Snap a photo with the Three Trunk Sycamore or the Tree Trunk Hideaway. See how many plants and animals you can identify while you visit. 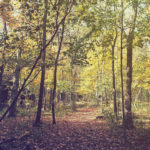 Allegheny Land Trust set out to acquire and permanently protect the Hollow from landfill development and other destructive activities after a 1994 scientific study identified the Hollow’s ecological significance. Over the years, several additional acquisitions expanded the Hollow to 450 acres. A master trail plan for the area was completed in Fall 2014, and ALT staff and volunteers have been implementing the suggested improvements since. The plan was designed with the goal of providing recreational and educational opportunities for the public at the Hollow consistent, and with the goal of protecting the conservation values within the Dead Man’s Hollow watershed. The Hollow was the site of a 19th century quarry and an early 20th century pipe factory. If one could spy into those years from the tops of today’s tall trees, the view would be dominated by acres of flattened muddy storage yards, huge coal fired kilns, rails, and road. However, with the pipe company’s end came a new beginning, and as the decades passed, a forest grew to overtake the factory’s buildings and kilns. The crumpled structures and remains stimulate the imaginations of visitors, as do the many legends of murder, natural disasters, and accidental deaths related to Dead Man’s Hollow. 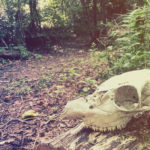 ALT has led interpretive hikes on the trails that focused on ecology and plant identification, the site’s history, and even the legends that fortify the Hollow’s ominous name.